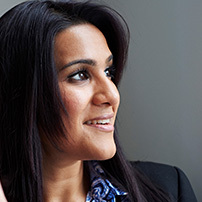 Manmeet Kaur Chowdhry has integrated her extensive study of human behaviour with her experience and knowledge of business management and sales to provide new technologies to empower individuals and teams to improve their performance and sense of fulfilment. Working both with individuals and groups internationally, she educates, mentors and facilitates their discovery of the true meaning of Love and Gratitude, both in their personal and professional lives. Manmeet helps individuals break free of the restrictions holding them back from living a life they love: a life that is purposeful, meaningful, inspiring and fulfilling.